“We are the highest taxed nation in the world,” President Donald Trump has repeated over and over again. …He said it at a White House event last Friday. He’s tweeted it, repeated it in television interviews and declared it at countless rallies. It is his go-to talking point, his favorite line… It is also false — something fact checkers have been pointing out since 2015. This fight revolves around the fact that Trump is referring to corporate taxes, but generally does not make that explicit. So you have exchanges like this. White House press secretary Sarah Huckabee Sanders sought for the second time in less than a week to defend the comment… “We are the highest taxed corporate tax [sic] in the developed economy. That’s a fact,” Sanders said when pressed on the comment during a briefing. “But that’s not what the president said,” a reporter retorted. “That’s what he’s talking about,” Sanders responded. “We are the highest taxed corporate nation.” “But that’s not what he said. He said we’re the highest taxed nation in the world,” said the reporter, Trey Yingst. Sigh. What a silly exchange. It reminds me of the absurd debate about “what the definition of is is” during the Clinton years. I start with the assumption that all politicians aggressively manipulate words, either deliberately or instinctively. Or maybe just out of sloppiness. So let’s look at three bits of data, starting with the numbers that are least favorable to Trump. Here’s a chart from the Organization for Economic Cooperation and Development. It’s definitely not my favorite international bureaucracy, but it has good apples-to-apples figures for developed nations. 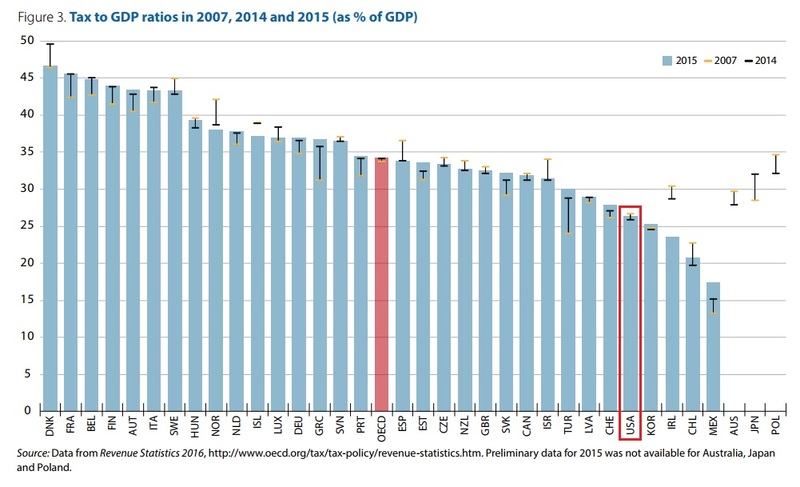 And you can see that the United States (highlighted in red) definitely does not have the highest overall tax burden. The President’s defenders can argue, with some legitimacy, that he often makes that claim while talking about business taxation. In those cases, it’s presumably obvious that “highest taxed” is a reference to corporate rates. And if that’s the case, looking at a second set of numbers, the President is spot on. 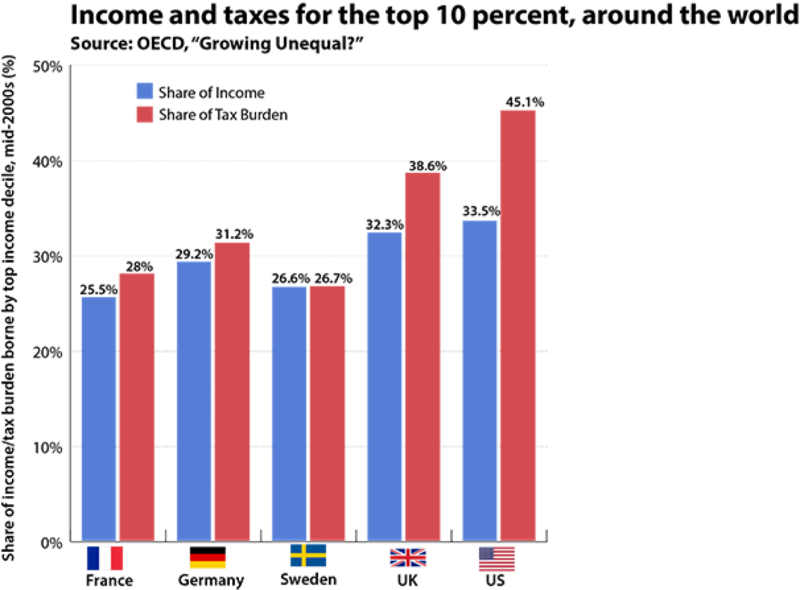 The United States unambiguously has the highest corporate tax rate among developed nations. And the U.S. may even have the highest corporate rate in the entire world depending on how certain severance taxes in developing nations are categorized. Moreover, the United States has a very onerous system of worldwide taxation, accompanied by rules that rank very near the bottom. In other words, Trump has a very strong case, but he undermines his argument when he doesn’t explicitly state that he’s talking about corporate taxation. There’s even a third set of numbers that Trump could cite when discussing the “highest taxed nation.” As I’ve noted before, the United States actually has the most “progressive” tax system in the developed world. But the President shouldn’t cite me when he can easily use quotes and data from the Washington Post on September 19, 2012. The United States has by far the most progressive income, payroll, wealth and property taxes of any developed country. Or the same newspaper on April 4, 2013. …the American system remains the most progressive tax system in the developed world. Or the Washington Post on April 5, 2013. A few readers were surprised by my mention Thursday that the U.S. tax code…is actually the most progressive in the developed world. But it’s true! …Our top 10 percent…pays a much higher share of the tax burden than the upper classes in other countries do. Here’s the most relevant chart. These numbers may not be terribly relevant for the current controversy since Trump’s tax plan is focused more on business taxpayers rather than individual taxpayers. But our friends on the left are very anxious to impose more class-warfare taxation, so we should file this data for future reference. P.S. The April 4, 2013, story in the Washington Post includes this very important passage. 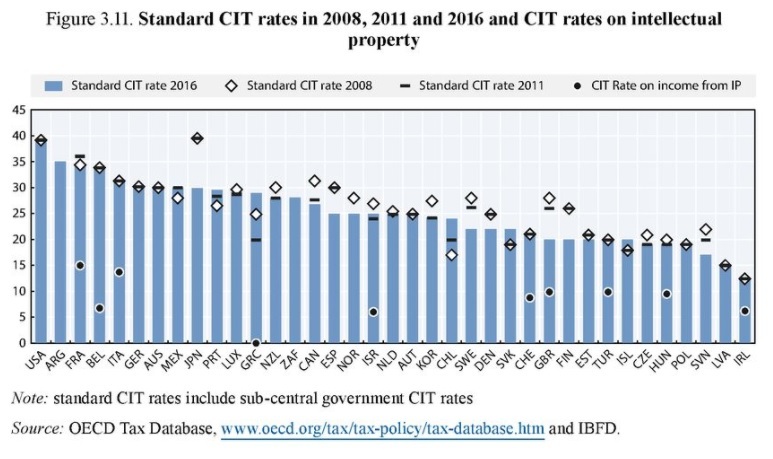 …social democracies like France, Germany and Sweden have actively regressive systems heavily reliant on value-added taxes. This reinforces what I’ve repeatedly noted, which is that Europe’s costly welfare states are financed by lower-income and middle-class taxpayers (in large part because of punitive value-added taxes). The bottom line is that we should listen to Bernie Sanders and become more like Europe. But only if we want ordinary citizens to pay much higher taxes and to accept much lower living standards.